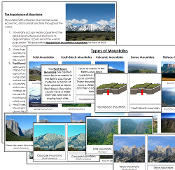 These information and photographic cards will help children learn to classify 5 types of Mountains: Fault-block Mountains, Fold Mountains, Volcanic Mountains, Dome Mountains, and Plateau Mountains. Cards with label are approx. 3¾" x 3½", cards without label are approx. ¾" shorter.